Winter in Alberta can be brutal — below zero temperatures, blizzards, ice storms and other forms of severe weather are common events during this time of year. Knowing how to be prepared before, during and after a winter storm will keep you and your family safe and warm. 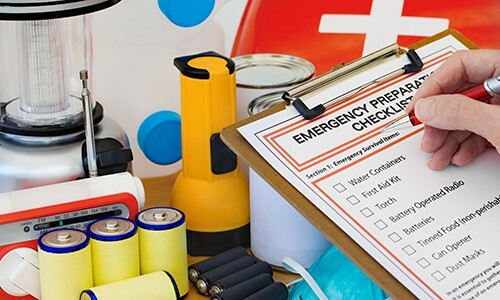 Read on for helpful tips on how to survive the season and use the emergency kit checklist below to ensure that you have the right supplies available in your home and car. Winterize your home. (link to the winter prep blog) Turn off exterior faucets, insulate pipes, trim branches, remove debris from gutters, etc. Have a family emergency plan and preparedness kit for your home and car easily accessible. Make sure that flashlights and other indoor lighting equipment are ready for immediate use. Charge your cell phones and other electronics that are necessary. Make sure you have snow removal equipment handy and have an alternative heat source (i.e. 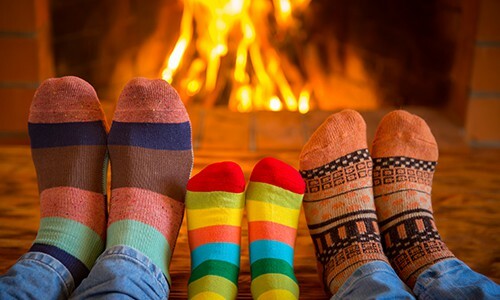 fireplace, wood burning stove, or a generator) to keep one room in your home warm and livable. Prepare your vehicle: inspect tires for pressure and treading, check anti-freeze levels, make sure headlights are clean, windshield wipers are working properly, and your vehicle has a full tank of gas. If you plan to evacuate, be sure to check local weather conditions before heading out on the road. Be prepared for secondary hazards such as power outage and flooding once snow melts. Make sure to have your emergency preparedness kit (home and car) available and ready for immediate use. If you decide to evacuate, take the kits with you. Remain inside, but if you must go outside, dress appropriately. Wear several layers of thin clothing, gloves or mittens, a hat (most body heat is lost through the top of the head) and a scarf. Conserve heat by closing off some rooms and if burning fires inside (e.g. fireplace, wood stoves, lanterns, etc.) especially kerosene, make sure to maintain ventilation to avoid carbon monoxide build-up. Snuggle up with your family in the same bed at nighttime to stay warm. Only drive if necessary and tell someone where you are going, the route you will take and when you expect to arrive if you must travel. If you are in your vehicle and must pull over due to the weather conditions, try to avoid stopping near power lines (that may fall during a storm). Allow fresh air inside of the vehicle by slightly opening a window on a side that is away from the wind. If the exhaust pipe isn't blocked by snow, run the engine for 10 minutes each half hour to keep warm. Try to move around periodically and DO NOT FALL ASLEEP — stay alert until help has arrived or the storm has passed. 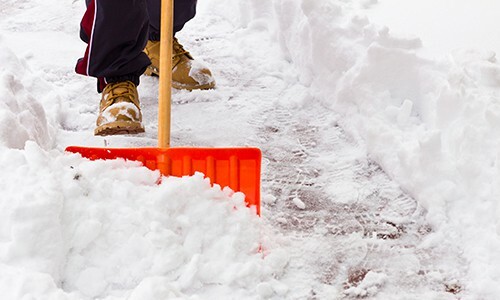 Avoid overexerting yourself when shoveling snow from around your home or vehicle. Cardiac arrest or hypothermia from sweating can be the result of over-exertion in frigid climate. Contact a snow removal professional if the snow around your home is excessive or the roof shows signs of distress. Attempting to remove substantial amounts of snow on your own could result in personal injury and structural damage. If your home has lost power or heat for more than a few hours and you do not have adequate supplies to stay warm, consider going to a designated shelter in your area, if you can get there safely. Monitor weather conditions closely before going outside and report downed power lines, broken gas or water mains and other dangerous situations to your local municipality or utility. Refrain from going outside right away to prevent injuries caused by debris and icy surfaces. If you do go outside, avoid contact with fallen power lines. Continue to conserve food and water until your area's emergency management authorities have confirmed conditions are clear to travel. When able, restock items used so that you will be ready for the next weather emergency. Call a plumber to inspect the pipes as soon as possible if they are frozen and shut off your home's water valve immediately (if you have not done so prior to the storm). Be aware of the wind chill. Avoid unnecessary exposure of any part of the body to the cold. If you have to go outside, dress appropriately and watch for signs of frostbite and hypothermia. Be careful when clearing snow. Take your time and avoid overexertion. Take regular breaks to warm up and rest if needed. Being prepared for a severe weather emergency means having basic items on hand for at least 72 hours. You can purchase a basic kit from disaster relief organizations like the Canadian Red Cross or, use the checklist below to build a customized kit containing supplies that fit the specific needs for you and your family.